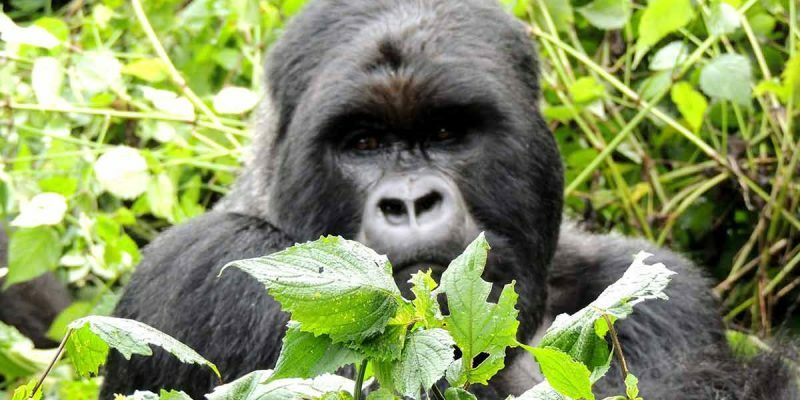 The 9 Days Uganda Wildlife & Gorillas of Volcanoes is a once in a lifetime opportunity to go to Virunga mountains in Congo to find the gorillas and spend some time with them in their natural environment. We shall also do the Nyiragongo volcano trek in DRC after which we shall track golden monkeys in Volcanoes National Park, Rwanda. We then head to Impenetrable Forest in Bwindi, Uganda for one more day of gorilla tracking. We will then visit Chimps in Kalinzu and go for game drives in Queen Elizabeth National Park before returning to Kigali. Kigali is well connected to Nairobi, Entebbe and also to several European Airports. Kigali is emerging as a proud city, known for its progressive start-ups, energetic art scene, and great dining and coffee. The city’s Caplaki Crafts Village has stalls selling traditional handicrafts, including woodcarvings and woven baskets. We shall spend the evening and night in Kigali. We shall have the Uganda Wildlife & Gorillas of Volcanoes safari driver/guide take us to Gisenyi which is a town situated on the shores of Lake Kivu at the border of Rwanda and DRC. After lunch, we shall cross the border into DRC. The night stay shall be at a lodge at the foothills of the Virunga mountains. This morning we shall go on the guided trek to see the mountain gorillas of Congo. In the early morning, we shall be assigned a park ranger and a gorilla family we will track. A maximum of 8 people are assigned to each of the gorilla families that are tracked. The trek can take 2 to 6 hours, depending on where our assigned gorilla family is. Once the ranger finds the gorilla family, we shall get to spend an hour with the gorilla family at close quarters. The distance is usually 10 to 15 meters. Though there are no guarantees with wildlife, there is a very high chance of seeing baby gorillas swinging from the bamboo branches and playing with each other. Being just a few meters away from a 300 pounds silverback and his family is an experience that is exhilarating and humbling at the same time. We shall embark on yet another amazing trek into the Virunga Mountains – this time to the crater rim of Mount Nyiragongo. The Nyiragongo volcano is what comes to mind when one thinks of Congo’s forests and mountains. It is an active volcano and has the world’s largest lava lake. We shall stay overnight at the rim of the crater. The views of the Virunga mountains and lava lake are among the best in all of Africa. This is a “must do” Africa experience. We shall start the day with a steaming cup of coffee at the rim. After enjoying the morning views of the Virunga national park and a light breakfast, we shall start our descent down the Nyiragongo mountain. The trek down usually takes about 3 hours. We shall then head to Goma and have a nice lunch at a restaurant overlooking Lake Kivu. After lunch we shall head to Kinigi in Volcanoes National Park in Rwanda. Volcanoes National Park of Rwanda is where Dian Fossey worked for years on Gorilla conservation. Here, we shall hike into the Volcanoes national park to see another endangered species of primates – the Golden Monkey. In the late afternoon – we shall head to Bwindi National Park. We shall spend the night at a lodge at the edge of the Bwindi forest. We shall get some well-deserved rest, looking forward to our next gorilla experience in Uganda. We shall head deep into the Bwindi Impenetrable National Park with the gorilla trackers. There are about 8 different families of gorillas that are habituated to humans and we shall go looking for the Rushaga family of gorillas. It may take 2 to 4 hours to locate the gorillas and when we do, we shall spend an hour hanging out with them. The Bwindi impenetrable forest is really special habitat and we are sure to come back with some amazing memories of the Ugandan gorillas. Today we shall head to Kalinzu and go for chimpanzee tracking. Unlike gorillas, the chimps stay mostly on tall trees and move around. There are about 300 chimps in this forest and so the probability of seeing a family of chimps is fairly high. The whole experience takes about 3 hours. In the afternoon we shall head to Queen Elizabeth national park and time permitting, go for a game drive there. Night at a lodge at Queen Elizabeth National Park. Queen Elizabeth National Park spans the equator. It is one of the best national parks north of Masai Mara. We shall start the day with an early morning game drive. After breakfast, we shall head back to Kigali. In the evening you shall take your flight back home or to the next destination. The best wildlife viewing months in Rwanda are during the Dry seasons from June to August and December to February. Primate walks in the forest are a big part of any safari in Rwanda. The habitat of rainforests is, by default, very wet, and one can’t avoid rain completely.